have the best view of the workpiece or process. only available for SIMATIC HMI Mobile Panels. time-consuming individual assembly and wiring, as required for conventional operator panels, is not necessary. savings of up to 60%. or SCADA solution to your respective automation task. any time and without problems. Optimized processes reduce the total cost of ownership, shorten the time to market, and improve quality. now, more than ever, the decisive success factor in industry. through configuring and programming as far as commissioning, operation and upgrading. degree of data consistency – throughout the entire engineering process. Siemens has redefined engineering with its Totally Integrated Automation Portal (TIA Portal). SINAMICS StartDrive automation software tools in a unique development environment. leading Industrial Ethernet standard and PROFIBUS, the global No. 1 fieldbus. identified and eliminated to provide increased system availability. the maintenance-relevant information of all automation components. relevant standards: IEC 62061 up to SIL 3, EN ISO 13849-1 up to PL e, as well as EN 954-1.
and comprehensive functionality of SIMATIC are also available for fail-safe applications. for building up protected cells. the SIMATIC quality guidelines, as are vibration resistance or electromagnetic compatibility. protection, extended temperature ranges, and exceptional environmental stress. switching with automatic event synchronization. and pre-assembled SIMATIC HMI Key Panels. This results in time savings of up to 60% compared to conventional wiring. Also available as fail-safe version. an attractive price. The series includes devices with displays sizes of 3" to 15". diagnostic functions and options for efficient energy management are examples of this. and local screens of all participating stations and communicate via PROFINET/Ethernet. are ideal for industrial applications even in extremely harsh industrial environments. operation. Some even offer both at the same time. optimal operator control and monitoring. backlit display is exemplary in any case. text import functions. Up to 32 languages can be administered in one project. 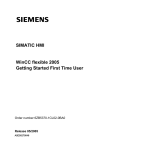 application, we recommend you use the SIMATIC HMI selection guide. with the most up-to-date product range. compared to the predecessor product WinCC flexible, particularly if SIMATIC Controller applications are being operated and monitored. also in their on-screen representation. and makes it easy for users to concentrate on essentials. open several editors simultaneously and to exchange data between them. Data is exchanged using drag and drop. different editors. Transparency is also gained from an objectoriented approach. Thus, archives and alarms are directly configured with the tags. of error, and compact and transparent projects are created. modified at any time – project-wide or for individual machines. The central modifiability of the blocks ensures consistency. be reused in the TIA Portal. Reuse saves on engineering costs and simultaneously increases the quality of the solution. SIMATIC WinCC V11 stands for maximum configuration efficiency: Libraries with off-the-shelf objects, re-usable faceplates, intelligent tools right up to multi-language projects. are simplified by means of graphical configuration. The Windows-compliant user interface is made up of parameterizable screen objects and project-specifically created faceplates. acknowledgement functions and the visualization of the respective alarm. Time and event-driven output of logs and reports. can create user groups who have specific privileges. WinCC Recipes is used to manage recipes that contain associated machine or production data. NEW Recipe data can be imported into the engineering system. WinCC [email protected] also permits access to SIMATIC HMI Panels from a PC via Internet Explorer. (Code of Federal Regulations), Part 11, for applications subject to validation. 60% time savings can be achieved during installation. can be reliably operated even when wearing gloves. The connection to the controller is made via PROFINET. achieve degree of protection IP65. e.g. an SIL 3 emergency stop button. The KP32F has 4 fail-safe, 24 V-capable digital inputs for sensors with isolated contacts. 3" to 15". They can thus be optimally adapted to the individually required visualization area and the available space on site. mounting, which results in even greater flexibility. and keys or combined touch and key operation are new. The 15" device is suitable for displaying large or especially detailed process screens. In this case, the application is exclusively controlled via the touch screen. Panels at the lower end with a 3" display. Basic Panels are also suitable for use in harsh environments. the same functions: The signaling system, recipe management, trend curve functionality, and trend and language selection can be used with any device. As standard, Basic Panels communicate over PROFINET. The 6"
and 10" devices are also available as a PROFIBUS version. supplement existing projects after an upgrade. 10 freely configurable function keys. The keypad with the design of a mobile telephone keypad allows intuitive and fast entry of numbers and words. WinCC Basic V11 in its scope of delivery. Basic can thus also be used as an alternative to an alarm indicator lamp. ensure maximum user-friendliness and energy efficiency. range of Basic Panels in the 4" segment. they can be optimally adapted to any application. during break times in order to reduce energy consumption. 9", 12", 15", 19", and 22" widescreen displays. NEW The range of SIMATIC Comfort Panels is expanded with the 15"
key panel and 15", 19", and 22" touch panels. by the wide viewing angle of 170°. existing plant structures and provides reliable investment protection. on ships and reduces the energy consumption. available space on-site and to the required visualization area. operation, devices with freely configurable keys are available. Panels have archives, VB scripts and various viewers for displaying plant documentation (e.g. as PDFs) and Internet pages. SIMATIC HMI Comfort Panels are robust and have several approvals for international usage and for use in sectors with increased requirements. PROFINET interface is also available. soon for all Comfort Panels. provide tactile feedback when pressed. no special cables are needed. device itself are not required. can be used for transferring a project to another device. Operation takes place intuitively via the touch screen or membrane keys, which provide perceptible and thus reliable feedback – even when the operator is wearing gloves. both by right-handed and left-handed people. additional operator controls can be configured as direct keys. the connection box and cable. With the optional wall bracket, the Mobile Panel can be securely stored or used as a stationary terminal. the control cabinet. The Connection Box Plus ensures faultfree hot-swapping. the user interface changes according to the connection point. Panel is plugged into the connection box. This enables machinespecific HMI authorizations or actions to be performed depending on the selected connection point. connected in series with integrated switches. machines in critical situations (dead man's switch). The acknowledgement buttons are integrated into the handle on the back. means of the connection boxes. In this way, the STOP button offers the functionality of an emergency stop button, but differs visually from conventional emergency stop devices due to its gray color to avoid confusion. HMI Mobile Panels with STOP button to one point of the plant. the Mobile Panel can be used at different connection points. connection box is automatically closed which prevents triggering of the emergency stop circuit. version for extreme environmental conditions (e.g. use in corrosive atmosphere/with condensation). The SIMATIC HMI Mobile Panel 277(F) IWLAN is a worldwide novelty in the field of operator control and monitoring: a wireless operator panel with full HMI functionality. IWLAN for SIMOTION applications as well. Smart Cards). This ensures reliable operation and the clear assignment of suitable operating screens and operator authorizations from any point in the plant. operator authorizations for specific persons. one meter, the device can be optimally used in tough industrial environments. The powerful batteries can be replaced without interrupting operation. This ensures trouble-free operation. device satisfies safety category SIL 3.
coordination function with management channel). This procedure – also known as "rapid roaming" – ensures almost uninterrupted handover of the wireless signals between the individual access points. emergency stop button on the operator panel becomes active. assembly and offer complete IP65 protection. • SIMATIC HMI IPC477C PRO 15" and 19"
• SIMATIC Flat Panel Monitor PRO 15" and 19"
• SIMATIC Thin Client PRO 15"
means of adapters, optionally on the top or bottom of the device. Both options are provided as standard. The fully enclosed SIMATIC HMI devices offer modular expansion capability. The corresponding expansion units can be attached on the left or right side of the operator panels. well suited for displaying machine statuses. or PCs over PROFINET/ Ethernet. maintenance and update costs are reduced. complete IP65 protection on page 20.
operating unit can be active at a time and operate the server. is frequently used with highly complex client/server architectures. also be produced for SCADA applications using thin clients. also be directly operated via a SIMATIC Thin Client. or monitor over Ethernet at an unlimited distance from the associated computer unit. desktop of the server via RDP and carry out remote operation. in the quality that you know from our standard products. go beyond a design change. OEM products are individual solutions based on SIMATIC standard products. individually designed device with TIA integration. obtain from us as the single-source supplier. They are combined, assembled, wired and pre-installed, ready-to-use according to your specifications and corresponding to the specific technical requirements of the standard products. in terms of technology and functionality. will be available with your own corporate design at short notice. • Food and beverage industry, pharmaceutical industry, e.g. • Oil & Gas, chemical industry and shipbuilding, e.g. of drilling towers, or outdoors. – Safety and hygiene requirements". The SIMATIC Multi Panel 377 15" Touch daylight readable features a special display and touch technology. This allows operator control and monitoring even in very bright environments. active heating and cooling in the control cabinet. The Temperature Extension Kit is available for this purpose. • 24-hour product support over the SIMATIC Hotline. sequence or in the logistics chain. standard products in one packaging unit, e.g. suitable for the respective machine type. The documentation is supplied on CD-ROM. various types of standard storage media. outlet can be rotated by 90°. Media Cards to the SD Card. and dirt on the front side. films for touch displays available. connectors with various connection methods available. 24 V DC power supply connectors can also be ordered. The S7-200 Micro PLC is compact, modular, and has different communication ports. optimally adapted to the performance and applications of the S7-200. bitmap and bar displays. They are suited to small-scale HMI tasks. color devices have a PROFINET/Ethernet interface in addition to the PROFIBUS interface. ruggedness, stability, and simple handling. openness and flexibility combined with rugged, compact, and cost-optimized hardware. where high vibration loads or dust-laden atmospheres restrict the use of a PC. products on the enclosed datasheet. families of systems can be found in the Internet sites listed below. Reduction of brightness by 50%, can be extended by dimming and ProfiEnergy. and monitoring outside of the control cabinet.